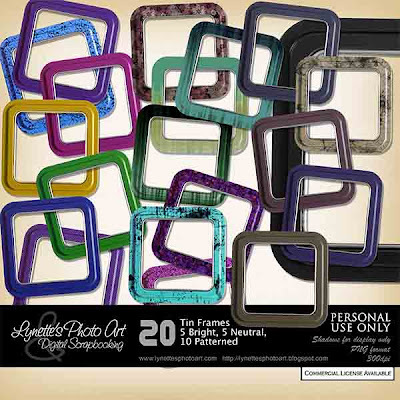 Tin Frames has 20 large, high resolution tin frames including 5 bright, 5 neutral and 10 patterned tin frames. $1.99 at my PayPal store. Click image to enlarge. Click Buy It Now button below image to purchase. Today I'm giving you a piece of this fun kit to try. Enjoy! Thank you so much for this Freebie. I want to let you know that I posted a link to your blog in Creative Busy Hands Scrapbook Freebies Search List, under the Page 11 post on Sep. 17, 2009. Thanks again.